Helious is one of those rare games that strikes at the very core of what gaming is all about. Like Super Mario Bros., Tetris, and Pac-Man, there are no frills or dazzling graphics in Helious, just a simple, fun gameplay concept executed to perfection. Helious is an MS-DOS game released in 1993 by Sean M. Puckett. It was a shareware title, which means it was distributed via the internet on message boards or by being passed around on floppy disks, which is how I got my copy well before I had internet access. They are no real characters to speak of in Helious, the player controls an air filled ball drifting free of gravity in a maze-like environment. 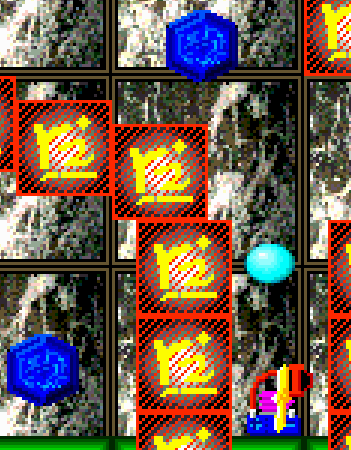 The ball rockets around the screen by releasing air. The ball deflates as air is expended, until finally, the ball runs out of air and vanishes, ending the game. With skillful handling it’s possible to move very efficiently while spending very little air, but many of the mazes feature narrow passages that the player must deliberately sacrifice air in order to fit through. Rouge missiles, spikes, locked gates, and other obstacles will also deflate your balloon. Air pumps placed strategically throughout the level give players the chance to re-inflate their ball, but the ball can fill to the point of bursting, which will also end your game and keep you constantly on your toes despite the relief finding these air pumps can bring when lost deep in a difficult level. 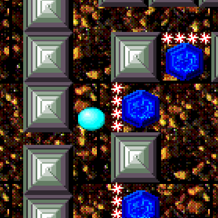 Blue gems are scattered throughout the nine levels, and the goal of each level is to collect all the blue gems and then touch the flag at the end of the stage. If all the blue gems have been obtained, the flag will transform into a glyph unique to that level, which must be written down or memorized by the player. 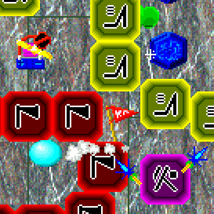 The nine glyphs must then be entered into the game’s clock-like level select screen. Correctly match each glyph with its appropriate icon on the level select screen, and you’ve completed the game. The glyphs can be entered into the level select screen at any time, and if you’re lucky, crafty, or already know the solution, you can beat the game without playing a single level. There is no scoring system, and beyond the title screen and instructions, not a single word of dialog, it’s just you and the blue ball hunting for the glyphs needed to solve the game. The controls are tight, the ball responds perfectly, yet maneuvering it will be a real test of any gamer’s precision and coordination. Mash the keys like you’re playing Super Mario Bros., and you’ll find the ball shooting in every direction and deflating rapidly. It takes a light hand to handle the ball, and a cool mind not to over-react to the zooming missiles, gun turrets, and spike traps found in later levels. Levels can be played in any order, but increase in difficulty as you move clockwise around the level select screen, with the Twelve O Clock level being the easiest and the Eleven O Clock being the most challenging. Starting with the third level, just reaching the flag is a challenge in itself, let alone collecting every single blue gem along the way. My suggestion is to do some practice runs, exploring each leavel with the goal of reaching the flag, and once you're good at that to then go after the blue gems. Helious is completely unforgiving, if you ball pops or deflates, you have to start the level from the beginning, no checkpoints or continues to help you out. The graphics are bright and crisp, and the visuals of each level unique. You really can’t ask much more from the graphics, they do their job perfectly, so they are by definition very good graphics despite the game being nearly twenty years old. Despite having no in-game dialog or plot progression, Helious incorporates an intriguing and creative back story which adds tremendously to the motivation to finish the game and is a large part of why I like it so much. Helious is accompanied by a short story accessible through the game’s title screen which explains that the “game” was actually not programmed or created Sean Puckett, but was left on Puckett’s computer during a close encounter in which extra-terrestrials invaded his home. After adding a title screen (Van Gogh’s “Starry Night”), digital instruction manual, and a shareware license asking that he be paid for the work of the aliens that visited his home, Puckett releases Helious to the world. I actually played Helious dozens of times before I realized that this back-story existed, and reading it added tremendously to the experience of playing the game. It makes you wonder what you’re doing moving this blue ball around. Is it a spaceship? Is it a microbe? Is it a computer virus? Are the blue gems some kind of food or fuel or something? What are the glyphs and symbols found around every corner of the game mean? The story aspect of Helious makes it the only game that I haven’t spoiled for myself despite not having beaten it in the eleven years I’ve been playing, which includes long breaks where I put my old DOS computer away for years at a time. It probably helps that Helious is pretty obscure and surprisingly I haven’t been able to find a solution to the game online. In fact, so few people are discussing Helious that it made me decide to make this page to give the game more exposure. Helious wasn’t intended to be played for free, and though it was is distributed free of charge back in the day, the game reminds that you should pay the company if you play the game more than twice by sending a check via snail mail to an obsolete address. The concept of demanding payment for something that has already deliberately been given away for free is almost laughably naive by today’s standards, but I suppose it worked at the time, because though I never sent any checks in the mail back in the 90’s, I did receive nearly every computer game I owned back then via shareware traded on floppy disks. There was a sequel to Helious which was advertised in an order form accessible from the title screen. The only way to get Helious II was to print out the order form and enclose it with money to the address specified, but since that address no longer exists, Helious II was virtually impossible to find until very recently when the creator of Helious put up a website and offered it for download. There’s not much else to be said about Helious. It can be downloaded free of charge from the internet and played on any modern computer via an MS-DOS emulator like DOS-BOX for PCs or Boxer if you’re like me and own a Macintosh. If you’re a newcomer to Helious and try it after reading this feature, please leave a comment in the guestbook and tell me what you think. I’d love to hear from you. Helious and Helious II can be downloaded from Sean Puckett's website.